Originally released in Canada in March 1999 by 13 Clouds Records. In the UK by Easy!Tiger Records in August 2001. And mainland Europe by Easy!Tiger/Virgin in October 2001. 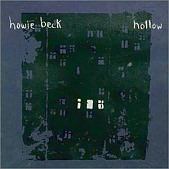 Howie Beck's Hollow will finally get its proper attention in the states on Devil In the Woods/Future Farmer. The songs are light and ethereal, as Beck serves up melancholy with a slight alt-country/folk touch wrapped around his pop centerpiece. Though sorrowful, Beck's songs still retains optimism. Not so much in his lyrics, but in the music. The airy songs flutter with pop prowess, helping to uplift you, even when Beck himself seems to see only dark days ahead. A lyrically and musically entertaining album, Hollow is as enriching as it is enjoyable. A heartfelt, tender explosion of pain and warmth, Beck writes songs for himself, though universal in stature so the listener can latch on and believe he's singing for them. I'll give it an A.